You are currently browsing the archives for the Collin Peterson category. During the Obama administration, Blue Dog Democrats sat silent. They didn’t offer plans to simplify the tax code or provide middle class tax relief. They especially didn’t criticize President Obama’s super-sized deficits. Simply put, they acted like spineless eunuchs. Now that there’s a Republican president that’s pushing major improvements to the tax code, though, Blue Dogs are suddenly criticizing plans that will strengthen the economy, create jobs and grow families’ 401(k)s.
Their position paper supports corporate tax reduction, income tax simplification, and emphasizes deficit reduction. That’s nice-sounding but it’s totally BS. They were nowhere to be found for 8 long yeas on the topic of deficit reduction. Had they stood up to President Obama and Nancy Pelosi back then, they’d have some credibility. The Senate bill includes the repeal of the individual mandate, which isn’t part of the House’s legislation. Last night during his townhall, however, Speaker Ryan said that House Republicans didn’t have a problem with repealing the individual mandate. Chairman Brady said that they wouldn’t add it to the House bill but said that they wouldn’t have a problem agreeing to it in the conference committee negotiations. The key part of Sen. Johnson’s statement is where he said “I do not support either in their current versions. I do, however, look forward to working with my colleagues to address the disparity so I can support the final version.” That isn’t slamming the door shut. It’s leaving the door wide open. Frankly, this sounds more like the opening of negotiations rather than a rejection. PETERSON: I didn’t vote for this bill. The reason I didn’t vote for it — the reason I didn’t vote for it is because I actually read the bill, which a lot of people didn’t. But we have to pass the bill so you can find out what’s in it. The key point in all this is that, if it’s true, Collin Peterson knew what was in the bill but didn’t criticize the ACA. It’s one thing to stay silent on a bill you mildly disagree with. It’s almost justifiable if you think it might work. There was nothing in the ACA that suggested it would work. Torrey’s sense of humor, combined with Torrey’s can-do attitude speak to one thing: that Torrey will be a positive, powerful force in Washington, DC. Agriculture is another major issue for Westrom, who currently serves on the state legislative agriculture committee. He said that serving on the agriculture committee in Washington, like his opponent currently does, “sure would be” a priority for him. Peterson has said that he supports the pipeline, but Westrom urged that his support of the project is not enough. In prior elections, Peterson neutralized the ‘Nancy Pelosi card.’ Apparently, that streak has met its match. Westrom isn’t just mentioning Pelosi’s name. He’s tying Pelosi to Peterson on the biggest issue in the district. Westrom has done a nice job of highlighting the House Democratic leadership’s environmental fanaticism. That won’t sit well in the 7th District. The thing that I’ve heard is that people appreciate Torrey Westrom’s demeanor and discipline. He isn’t afraid to highlight differences like he did in this interview. Still, he’s been respectful while highlighting policy differences he has with his opponent. That’s an admirable trait, one which says he’ll fight for his policies and principles without vilifying people he’ll need to work with. Minnesota’s 7th District needs that type of leadership and character. A vote for Westrom is a vote for principled leadership. Where will Nolan’s money go? After last night’s bombshell polling data from Minnesota’s Eighth District, the next questions are quite logical. First, when will the DCCC and Nancy Pelosi’s PAC pull their money from the Mills-Nolan race? Second, when that money is pulled, where will it be spent? McFadden knows that his message sells in the Seventh. He’s campaigned with Torrey before, too. It’s obvious that they feed off each other and complement each other nicely. Why would Pelosi’s superPAC or the DCCC shift money into that situation? Finally and most importantly, a little money pays for tons of ads in the 7th. How much more money does Collin Peterson need to win that race? People know Peterson because he’s finishing his twelfth term. If the first and second ad buys didn’t put Peterson over the top, why would the DCCC think that the third and fourth ad buys will? Known commodities are known commodities. If they don’t sell right away, they won’t jump off the shelf later. Pelosi’s superPAC and the DCCC have other seats that need propping up. Nolan’s seat is history. He’s an ancient candidate whose policies are from the 1970s. There’s nothing that indicates he’ll catch fire in the last 2 weeks. Peterson has a better shot at winning but that’s because he’s frequently won with over 60% of the vote. He’s either popular and heading for victory or people have tired of him and he’s heading for defeat. There isn’t a middle ground with him. Ken Martin, the DFL, Steve Simon, Gov. Dayton and Sen. Franken are watching these races. That’s because they know their races are based, at least partially, on doing well in these districts. If Nolan and Peterson lose, Gov. Dayton’s, Sen. Franken’s and the DFL’s path to victory gets complicated fast. The Tarrance Group is pleased to present the following findings from our recently completed telephone survey of N=300 registered “likely” voters in Minnesota’s Seventh Congressional District. The Tarrance Group was commissioned by the National Republican Congressional Committee (NRCC) to conduct a telephone survey in this district. A random sample of this type is likely to yield a margin of error of +5.8% in 95 out of 100 cases. Responses to the survey were gathered October 12-14, 2014. Torrey Westrom has pulled ahead in the race for the congressional seat long held by DFL incumbent Collin Peterson. Westrom has made steady improvement throughout the campaign and now eclipses the incumbent. Turnout modeling puts the race at 48% Westrom and 46% Peterson, with only 6% undecided. Those undecided voters do not seem likely to break toward an incumbent they know so well. With a margin of error of 5.8% and with the race being this close, this race is anything but settled. Also, it’s always wise to question private partisan polls. Still, this can’t give the Peterson campaign comfort. Sen. Westrom has fought a great campaign. He’s raised the money to be competitive. He’s travelled the district to increase his name recognition. He’s enunciated a message that’s resonating with voters. In short, he’s given Peterson a legitimate reason to worry. It isn’t accidental that the DCCC has spent a few fists full of money on advertising. That advertising has mostly focused on criticizing Sen. Westrom for his alleged role in the Dayton government shutdown. Prior to this partisan private polling, this already figured to be Peterson’s toughest re-election fight yet. That fight just gained in intensity. The thing is that the DCCC has already thrown the kitchen sink at Torrey. They don’t have many bullets left in the clip. Entering this summer, conventional wisdom was that Stewart Mills had a better shot at defeating Rick Nolan than Torrey Westrom had of defeating Collin Peterson. That’s mostly due to the fact that Rick Nolan wasn’t the top-tier candidate that Peterson was. Apparently, Peterson isn’t as popular in the district as his recent election numbers indicated. Going into this summer, I thought Republicans would win either defeat Peterson or Nolan. I didn’t think they’d defeat both of them. I still have trouble believing that they’ll accomplish that feat but it’s definitely a better possibility today than a month ago. If Republicans flip both seats, it’ll be bad night for the DFL and for Nancy Pelosi. (ALEXANDRIA, Minn.) – Torrey Westrom, the Republican nominee for Minnesota’s 7th Congressional District, today announced the endorsement of former U.S. Ambassador John Bolton. Ambassador Bolton served as the U.S. permanent representative to the United Nations from 2005-2006, and served as the Under Secretary of State for Arms Control and International Security from 2001-2005. This is a little different than other endorsements because Ambassador Bolton isn’t a politician. It’ll be interesting to see what impact this will have but it’s interesting from this standpoint: Politicians aren’t held in high regard. People have much more respect for diplomats than they have for politicians. The Westrom campaign has released new internal polling numbers that report Republican Torrey Westrom is essentially tied within the margin of error, with 12-term incumbent Democrat Congressman Collin Peterson. Attached is a memorandum from our pollster, Brian Tringali of The Tarrance Group, that underlines key figures and points to an extremely favorable environment for Westrom, the challenger. The ballot score reports an incredibly close race. 12-term incumbent Congressman Collin Peterson sits well below the majority threshold with just 45% of the ballot share, while Westrom is just 5-points behind with 40% support. Fully 15% are still undecided. Important to note, the Westrom camp has yet to air a single television ad. 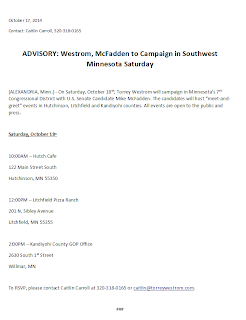 Peterson has been on the air for two weeks running positive spots, while in contrast the DCCC is airing negative attack ads against Westrom. The Tarrance Group is a well-respected Republican polling organization. When I first heard about them, Ed Goeas was the chief pollster. If this poll is accurate, then Collin Peterson is in trouble. The fact that Peterson is well below 50% even though Sen. Westrom hasn’t run a single TV ad isn’t good news for Peterson. It’s bad news for Peterson that 2 weeks of DCCC attack ads haven’t stopped Torrey’s momentum. There’s no question that it’ll be a tight race to the finish. Still, Peterson’s campaign can’t be happy at this point. Man: [During] the Eisenhower Administration, we built our infrastructure, our roads, our bridges, our schools, our fire halls, we built that during that era and the tax rate on the wealthiest people was 60 percent, and it was an honor for them, and society looked up to them, they were pillars in their community and respected, and we appreciated them. And now all I see is scapegoating on the poor, blaming people on food assistance when they can’t even get a part-time job… I’m saying that [rich people] pay less in income tax than poor people do. Westrom: Even though 48 percent of Americans don’t pay taxes? About 70 percent of the construction and maintenance costs of Interstate Highways in the United States have been paid through user fees, primarily the fuel taxes collected by the federal, state, and local governments. To a much lesser extent they have been paid for by tolls collected on toll highways and bridges. The Highway Trust Fund, established by the Highway Revenue Act in 1956, prescribed a three-cent-per-gallon fuel tax, soon increased to 4.5 cents per gallon. In 1993 the tax was increased to 18.4 cents per gallon, where it remains as of 2012. The next indicator that this activist isn’t the brightest bulb in the chandelier is that he thinks “poor people” pay more income taxes than “the rich.” Sen. Westrom dispatched that argument by telling the activist that “48 percent of Americans” don’t pay income taxes. Man: The Bible says, ‘To whom much has been given, much shall be required.’ Now [the wealthy] built that infrastructure and they did that out of the goodness of their hearts in the ’50s and now it’s like pulling teeth to get an extra dime out of the wealthiest people in this society, and I’m tired of it. Before getting into Sen. Westrom’s reply, let’s focus on the activist’s statement that “the wealthy built that infrastructure…out of the goodness of their hearts…” That’s the picture of delusion. The truth is that “the wealthy” built much of this nation’s infrastructure to create bigger profits for their companies. As for Sen. Westrom’s statement, he’s right in his philosophy of letting the people keep their money. The thought that the federal government knows best is intellectually laughable. For instance, Minnesota had a great health insurance system that featured one of the lowest rates of uninsured in the nation. In 2011, 93% of Minnesotans were insured. In 2013, thanks directly to the Affordable Care Act, that rate of insured ‘jumped’ to 95%. It just cost Minnesotans the paltry amount of $160,000,000 and counting. The MNsure website still isn’t working. In fact, it won’t be working correctly until after this fall’s open enrollment. Thank God for the federal government’s intervention. I don’t know what we would’ve done without their assistance, though I’d love to find out. 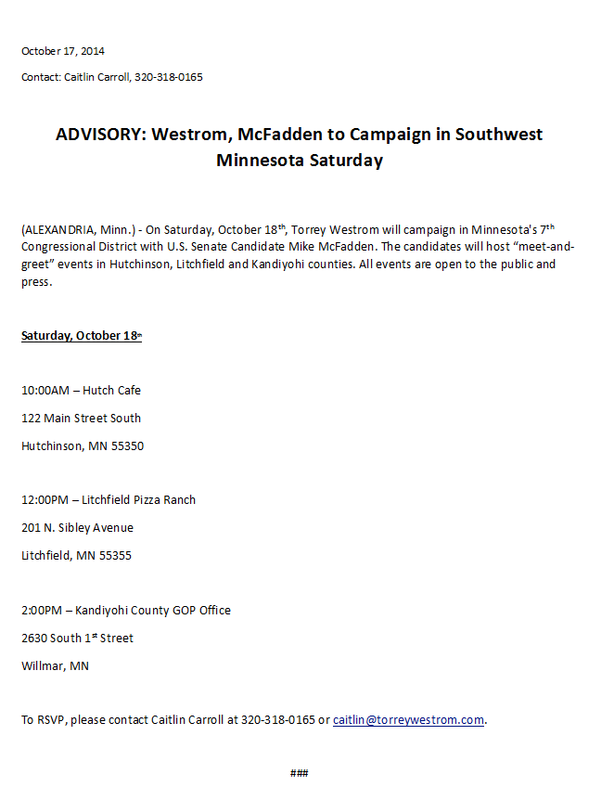 Sen. Westrom won’t take the 7th District for granted like Collin Peterson has for the last 20 years. Sen. Westrom has a history of getting things done. That’s the type of congressman Minnesota’s 7th District needs. “The Keystone pipeline needs to be built, I am here to tell you, and it should have been built last year, not delayed another several months as we are seeing under this current Administration,” Westrom said. Without the pipeline, oil producers are using an increasing number of railcars to transport their supply, which is squeezing out farmers and propane suppliers. When it comes to getting things done in DC, Collin Peterson is about as worthless as a potted plant. He didn’t stand up to President Obama and the environmental activists that run the EPA or the spineless diplomats in the State Department. Thanks to Congressman Peterson’s spinelessness, grain elevators in Minnesota’s 7th District are hurting. Minnesota’s 7th District doesn’t need a DC insider with ‘influence’. Minnesota’s 7th District needs someone who gets things done. Collin Peterson is rich with DC insider influence. Unfortunatly, he isn’t the type of congressman who gets important things done that help his district. If voters in Minnesota’s 7th District dump Peterson, they’ll immediately see the difference in the number of important things that get done compared with Peterson’s potted plant routine. Peterson loves DC’s ineffective status quo. He doesn’t really have to do anything. All he has to do is talk about how much institutional influence he has. What Peterson can’t talk about is how his presence in DC is helping reduce regulations or improve life in Minnesota’s 7th District. Throughout the forum, panelists expressed concern about government overreach, asking other candidates about the Environmental Protection Agency’s proposed rule on navigable waters and delay on the Renewable Fuel Standard. The EPA is a farmer’s worst nightmare. Daily, they micromanage what a farmer can and can’t do. Their new rule will get struck down by the Supreme Court because it goes far beyond the legislative language of the Clean Water Act, aka the CWA. Not that Collin Peterson cares but the EPA can’t implement a rule that goes beyond the legislative language. That language currently says the EPA can regulate navigable waters. The EPA’s rule would allow them to regulate waters not considered navigable. At one point, Collin Peterson was a tolerable congressman. Those days have passed. In 2009, Nancy Pelosi corrupted him. He hasn’t been a Blue Dog Democrat since. That says one thing: it’s time for a change. Like Oberstar’s previous bill, ACCWA does two things. First, it eliminates the term “navigable” from all sections of the Clean Water Act (CWA). The term “navigable waters of the U.S.” is used more than 80 times in the CWA. NACo continues to oppose the removal of “navigable” from the act, because of the danger its absence poses to years of hard-won jurisdictional parameters. Second, ACCWA removes the reference to “activities affecting” those waters and redefines “waters of the U.S.” by using a hybrid of current agency regulatory definitions. While ACCWA uses language based on existing agency regulations for a “water of the U.S.,” it is not identical to existing regulations. Furthermore, certain sections of the existing regulations were deleted and new language was added to the “waters of the U.S.” definition in ACCWA. Today, Torrey Westrom submitted comments to the Environmental Protection Agency over the EPA’s proposed rule to redefine “waters of the U.S.” – or navigable waters – under the Clean Water Act. The Environmental Protection Agency’s latest proposal to change the definition of ‘navigable waters’ under the Clean Water Act is a naked attempt to expand their own authority beyond the scope of the law and will have devastating consequences for Minnesota’s farmers, families, land owners and small business owners. Congress was clear when it passed the Clean Water Act that the EPA’s authority would cover ‘navigable’ waters, but this new rule will extend the EPA’s authority to everything from small ponds to ditches in fields. This is government overreach, pure and simple. Federal officials are throwing the legal definition to the wayside and creating nearly limitless regulatory authority, which will hurt our communities. Any changes should be made through the legislative process, where voters can keep government accountable, rather than through a federal agency’s rule making. Farmers and small business owners in places like where I live in Elbow Lake, and our surrounding agriculture communities in northwest Minnesota, cannot afford any more burdensome regulations handed down from the federal government. After a historically harsh winter and with a sluggish economy, the last thing America’s agriculture sector needs is unnecessary burden that will stifle business. We know our towns, down to the ponds and ditches in our fields, better than any unelected bureaucrat from Washington. Democrat front groups are undoubtedly cheering the EPA’s proposed rule. These Democrat front groups, like the Sierra Club, the Nature Conservancy and other like-minded environmental activist organizations want the federal government to have jurisdiction over every drop of water in the US, regardless of whether it’s navigable water that forms the border between Minnesota and Wisconsin or whether it’s a low spot on private property in Idaho that occasionally has water in it. The Clean Water Act, aka the CWA, specified which waters were covered by the Act. Because the CWA was passed by Congress and signed by the President, the legislation’s scope is limited. If they’d wanted the federal government to control all of the water in the United States, they should’ve written that into the bill. That’s where the Sierra Club’s, the Nature Conservancy’s and the League of Conservation Voters’ plan falls apart. Had that been written into the text of the CWA, people would’ve been outraged. Further, the executive branch isn’t allowed to change the clearly written language of a signed bill. Only the legislative branch is allowed to do that. The executive branch’s responsibility is to “faithfully execute” the laws that Congress enacts. If they don’t like specific provisions in a law, their only constitutionally sanctioned option is to talk Congress into changing that language. Sen. Westrom is right in criticizing the federal government’s plan to govern through executive fiat. This isn’t a kingdom. It’s a constitutional republic with a clearly written Constitution. Frankly, I don’t care if the EPA likes or hates the CWA. Their chief responsibility isn’t predicated on whether they like or hate a bill. Their chief responsibility is to faithfully execute the laws that are on the books, not the laws they wished were on the books.